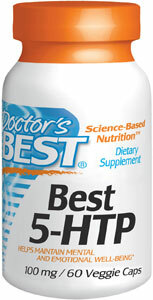 Feel Good Again with 5-HTP - no more anxiety! Maintains mental and emotional wellbeing. 5-HTP (from a natural botanical extract) naturally increases production of serotonin with no side effects compared to prescription anti-depressants (SSRIs). Serotonin levels are important for: Improved Sleep, Decreased Depression, Relief from Anxiety, Weight loss/ Suppressed appetite, Reduced cravings for carbohydrates and alcohol - Alcoholics have depressed levels of serotonin.